ON A SUNNY DAY in May 2011, we were visiting in North Carolina, and we headed out to Kitty Hawk. Our mission was to meet "Uncle Willie Dough" (Willie St. Clair Dough)---in the form of a life-size statue at Wright Brothers Memorial Park at Kitty Hawk. Not until the previous October, in a visit with my cousin Rachel Dough Smith, did I learn of our family connection with the historic First Flight of the Wright Brothers. In 1901, Dough had become a surfman at the Federal Life Saving Station at Kill Devil Hills. He and the men of that station befriended the Wrights and kept them supplied with food and any help and supplies they might need as they prepared for that historic flight. The Wrights would later write of the surfmen as "hospitable and indispensable." (The Stations later evolved into the U.S. Coast Guard, and its entwined history with the Wrights at Kitty Hawk is well recorded in Coast Guard archives). On Dec. 17, 1903, the day of the flight, the Wrights raised a flag as a signal to the surfmen that help was needed. 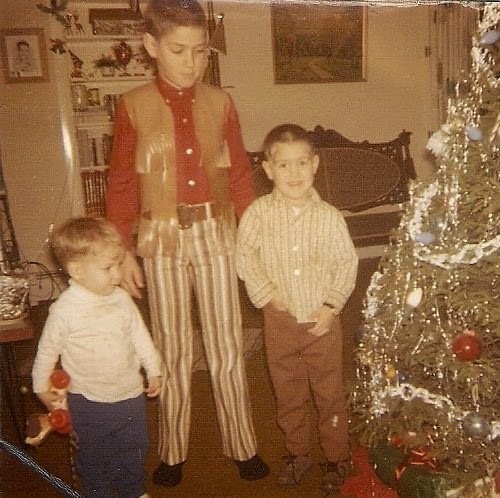 Willie was one of three who answered the call. Willie helped to push the plane into place for take-off and pushed it off the rail for take-off from the hill. Later when Wilbur and Orville Wright returned to the Hills for further flight experiments, Willie continued to help. In 1907 he settled the name Wilbur Wright Dough on a newborn son. Later he testified before a Congressional Committee as to the details of the First Flight, and in 1928 as a witness and survivor, he helped to lay the cornerstone of the Wright Brothers Monument at Kitty Hawk. He died in 1931. On A blue-sky afternoon at Kitty Hawk in the year 2011, my husband Bob, my sister Mary and I, with my nephew, frolicked around the park like little kids, knowing full well that this idyllic weather was far different from the harsh day when Wilbur and Orville had changed history. 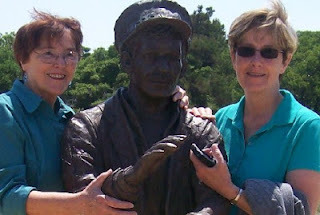 (THIS POSTING INCLUDES A PHOTO OF MY SISTER MARY AND MYSELF, AT KITTY HAWK IN 2011, MEETING THE STATUE OF 'UNCLE WILLIE,' WHO WAS ONE OF 'THE THREE INDISPENSIBLE MEN' NOTED IN THE WRIGHT BROTHERS RECORD OF THAT DAY). And normal they are not. They tend to talk a lot. Is when they're off to bed! "To every thing there is a season, and a time to every purpose under the heavens... "